A reporter for AlterNet and a contributor at the media watch group FAIR, Norton just wrote the piece “MSNBC Ignores Catastrophic U.S.-Backed War in Yemen.” Norton writes that for “MSNBC, the largest humanitarian catastrophe in the world is apparently not worth much attention — even as the U.S. government has played a key role in creating and maintaining that unparalleled crisis. “An analysis by FAIR has found that the leading liberal cable network did not run a single segment devoted specifically to Yemen in the second half of 2017. “And in these latter roughly six months of the year, MSNBC ran nearly 5,000 percent more segments that mentioned Russia than segments that mentioned Yemen. “Moreover, in all of 2017, MSNBC only aired one broadcast on the U.S.-backed Saudi airstrikes that have killed thousands of Yemeni civilians. And it never mentioned the impoverished nation’s colossal cholera epidemic, which infected more than 1 million Yemenis in the largest outbreak in recorded history. 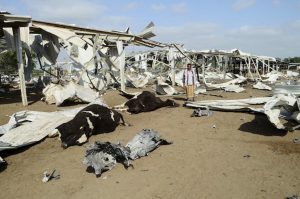 “All of this is despite the fact that the U.S. government has played a leading role in the 33-month war that has devastated Yemen, selling many billions of dollars of weapons to Saudi Arabia, refueling Saudi warplanes as they relentlessly bomb civilian areas and providing intelligence and military assistance to the Saudi air force. “And while Trump has largely betrayed his campaign promise to put ‘America first’ — particularly with regard to the Middle East policy being pursued by his son-in-law, Jared Kushner — he does so at the risk of alienating his base. “Nevertheless, the new survey indicates that the desire for a sensible American policy abroad goes well beyond Trump’s base, and that there is a wide bipartisan majority that seeks an American foreign policy of realism and restraint.